Tim Hudson holds the Indians to four hits over seven innings. Giants slugger Michael Morse received a couple of batting tips from home run king Barry Bonds during spring training. He obviously heeded the advice. 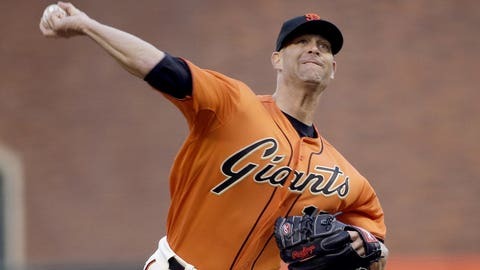 Morse homered for the second consecutive game to back another stellar outing by Tim Hudson, and San Francisco beat the Cleveland Indians 5-1 on Friday night. "One thing Barry told me was just go up and try to get hits," Morse said. "Home runs are a product of good swings." Morse might have been channeling Bonds a bit when he hit a towering blast to right-center off Cleveland starter Carlos Carrasco. The leadoff shot in the fourth went to one of the deepest parts of the park and is Morse’s sixth home run of the season. He also drove in a run with a sacrifice fly in the first. "For a guy to hit the ball where he hit it, a man has to do that," San Francisco manager Bruce Bochy said. "I guess that’s why he’s got the nickname The Beast." Hunter Pence had two hits and two RBIs while Brandon Crawford also knocked in a run to help the Giants win in their first interleague game of the season after going just 6-14 against the American League in 2013. Hudson (3-1) scattered four hits over seven innings and struck out five. He walked two, ending an impressive streak of 30 consecutive innings without one. Michael Bourn tripled and scored Cleveland’s only run. Jason Kipnis and Nick Swisher added two hits apiece for the Indians, who lost for just the second time in six games. The Giants jumped on Carrasco for two runs in the first inning, then rode the pitching of Hudson and two relievers to the win in their first game against a team outside of the NL West this season. Hudson had not issued a walk in his first four starts this season before giving up a free pass to Carlos Santana with two outs in the first. It was the longest walk-less streak to start a season by a pitcher in the majors since Tiny Bonham’s 33-inning stretch for the New York Yankees in 1944. Hudson also walked Santana in the sixth. Beyond that, San Francisco’s crafty right-hander was solid in his first start against the Indians since May 30, 2004. He pitched out of two-out, two-on jam in the first and retired nine straight after giving up an RBI single to Nick Swisher in the third. "It was a nice streak to start the year," Hudson said. "Obviously it was not going to continue all year. That’s not typically the kind of pitcher I am." Jeremy Affeldt pitched a scoreless eighth and Javier Lopez worked the ninth to complete the five-hitter. Morse, who homered twice in Wednesday’s extra-inning win over Colorado, made it hold up with a sacrifice fly in the first and a leadoff home run in the fourth, a booming shot to center on an 0-2 pitch from Carrasco. Pence added an RBI triple in the first and an RBI single in the third. Both times he drove in Angel Pagan. Carrasco (0-3) allowed four runs over six innings. The right-hander, winless over his past 17 starts dating to 2011, struck out six and walked one. He didn’t get much support, either. The Indians had two runners on in the first, sixth and eighth but failed to score each time. The bottom six spots in Cleveland’s lineup went 0-for-21. "We couldn’t generate enough offense to climb back in," Indians manager Terry Francona said. "(Carrasco’s) fastball was kind of what plagued him tonight right from the get-go. He was scattering some fastballs and I think that’s what got him in a little bit of trouble." Pagan had two hits in his return to the Giants lineup after being limited to a pinch-hitting role on Wednesday. San Francisco’s leadoff hitter underwent an MRI on Thursday and was diagnosed with what manager Bruce Bochy called a "chronic small tear" of the patella tendon in his right knee. The Giants made it 5-1 when slumping Pablo Sandoval tripled in the seventh and scored on Brandon Crawford’s single. Sandoval, who went into the game batting just .165, was dropped to sixth in the Giants’ order and went 1-for-3. NOTES: Bochy said he plans to keep Morse in the No. 5 spot as protection for cleanup hitter Buster Posey. Morse leads the Giants with 17 RBIs. … RHP Tim Lincecum (1-1), who pitches for San Francisco on Saturday, has struck out 24 hitters in 21 innings. … RHP Zach McAllister (3-0) goes for the Indians and has not allowed a home run in 31 consecutive innings dating to 2013.